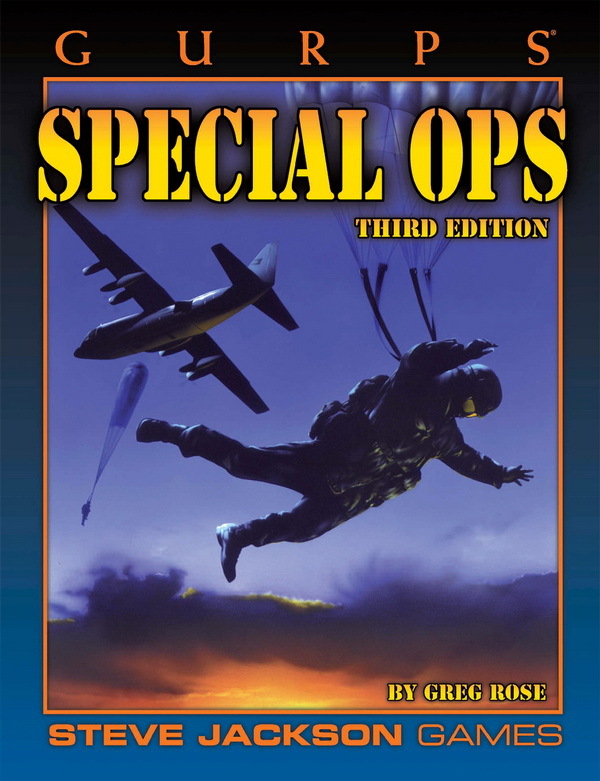 Bibliography for GURPS Special Ops 2nd Ed. Adams, James. Secret Armies (Bantam Books, 1989). Andrew, Christopher. Sword and Shield (Ballinger, 1986). Bank, Aaron. From OSS to Green Berets (Presidio Press, 1986). Barnett, F., Tovar, B.H. and Schultz, R.H. Special Operations In U.S. Strategy (National Defense University Press, 1984). Barron, John. The KGB Today: The Hidden Hand (Reader's Digest Press, 1983). Beaumont, Roger. Military Elites (Bobbs-Merrill, 1974). Beckwith, Charles and Knox, Donald. Delta Force (Harcourt Brace Jovanovich, 1983). Bloch, Jonathan. British Intelligence and Covert Action (Brandon Junction, 1983). Brown, Ashley. Elite Forces, Israeli Paras (Orbis, 1986). Dewar, Michael. The British Army in Northern Ireland (Arms and Armour Press, 1985). Dickens, Peter. SAS: The Jungle Frontier (Arms and Armour Press, 1983). Eshel, David. Elite Fighting Units (Arms and Armour Press, 1984). Harclerode, Peter (editor). The Elite and Their Support (Strategic Publishing, 1986). Hastings, Max and Jenkins, Simon. The Battle for the Falklands (Michael Joseph, 1983). Kelly, Ross S. Special Operations and Nations Purpose (Lexington Books, 1989). Kitson, Frank. Gangs and Countergangs (Barrie and Rockliff, 1960). Lanning, Michael. Inside the LRRPs (Ivy Books, 1988). Lanning, Michael and Stubbe, Ray. Inside Force Recon (Ivy Books, 1989). McNab, Andy. Bravo Two Zero (Dell, 1996). McNab, Andy. Immediate Action (Dell, 1996). Moyer, Frank. Special Forces Foreign Weapons Handbook (Paladin Press, 1983). Neillands, Robin. In the Combat Zone (New York University Press, 1998). Paddock, Alfred, Jr. US Army Special Warfare (National Defense University Press, 1982). Peterzell, Jay. Reagan's Secret Wars (Center for National Security Studies, 1984). Pitt, Barrie. Special Boat Squadron (Century, 1983). Richelson, Jeffrey. Foreign Intelligence Organizations (Ballinger, 1988). Richelson, Jeffrey. US Intelligence Community, The (Ballinger, 1985). Ryan, Paul. The Iranian Rescue Mission, Why It Failed (The Naval Institute Press, 1985). Schemmer, Benjamin. The Raid (Harper and Row, 1976). Simpson, Charles. Inside the Green Berets (Berkeley Books, 1984). Stanton, Shelby. The Green Berets at War (Galahad, 1987). Strawson, John. A History of the SAS Regiment (Secker and Warburg, 1984). Tophoven, Rolf. GSG 9: German Responses to Terrorism (Bernard and Graefe Verlag, 1984). Waller, Douglas C. The Commandos: The Inside Story of America's Secret Soldiers (Dell, 1994). Zaloga, Steven J. Inside the Blue Berets: A Combat History of Soviet & Russian Airborne Forces (Presidio Press, 1995).